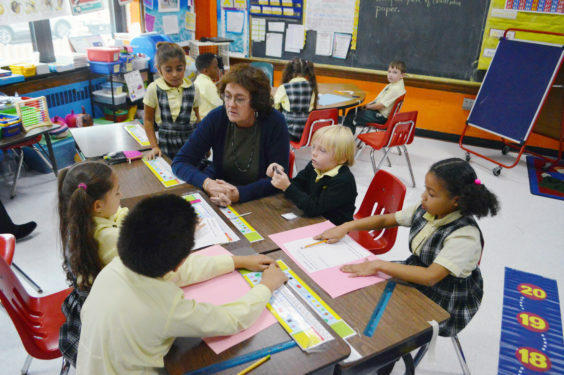 St. Camillus Catholic Academy in Rockaway Park is proud to announce that it has partnered with Molloy College, Rockville Centre, to concentrate on better meeting students’ needs in the classroom and beyond. The partnership began this fall and was fostered by the Diocese of Brooklyn, especially Superintendent of Schools, Dr. Thomas Chadzutko, with the support of St. Camillus’ new principal, Raffaele Corso. The partnership began with two professional development days with faculty members from Molloy College. Those two days included an analysis of diagnostic test data and group discussions about the needs of St. Camillus’ students. Several coaching visits, during which Molloy faculty observe and interact with St. Camillus faculty and students – have taken place and yielded valuable feedback. Molloy College staff, led by Maggie Blair, an assistant professor of education, visited again in early November to observe faculty and take an active part in the day’s lessons. At the end of the day, the Molloy faculty facilitated professional development sessions with St. Camillus faculty. The focus was on current educational research and higher-level thinking strategies and the best ways to incorporate these into class lessons. The ultimate goal is to bring each student – based on his or her individual learning style and ability – to a new level of thinking and learning.